It’s time to celebrate everything pasta! Why? Because today, October 25th, is World Pasta Day. On behalf of Barilla, I invite you to join me in enjoying delicious pasta recipes made with Barilla products. I’ve got one yummy recipe to share with you today that I think you will love. My family gobbled it up in record time. One thing I love about using Barilla pasta in my recipes is that I can always count on top notch quality and delivering consistent, fabulous results. 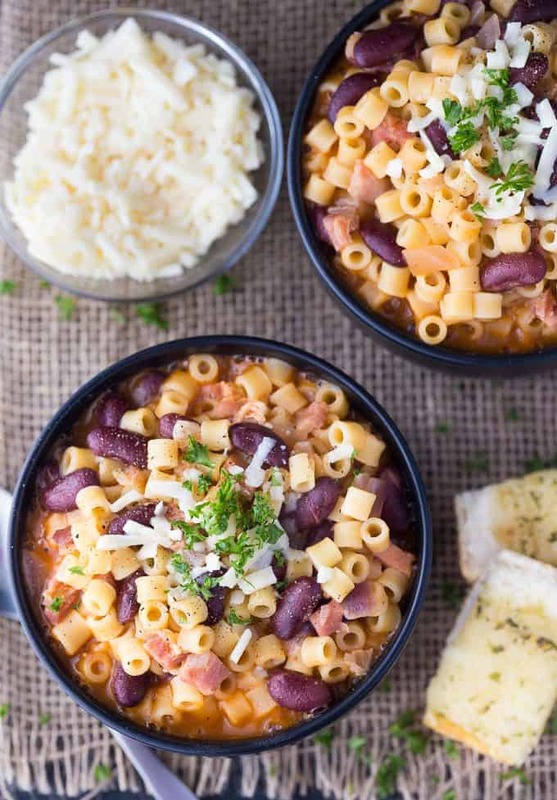 This Pasta e Fagioli recipe was no different. It tasted delicious and was super easy to make. It’s one of the many pasta recipes Barilla shared with me. 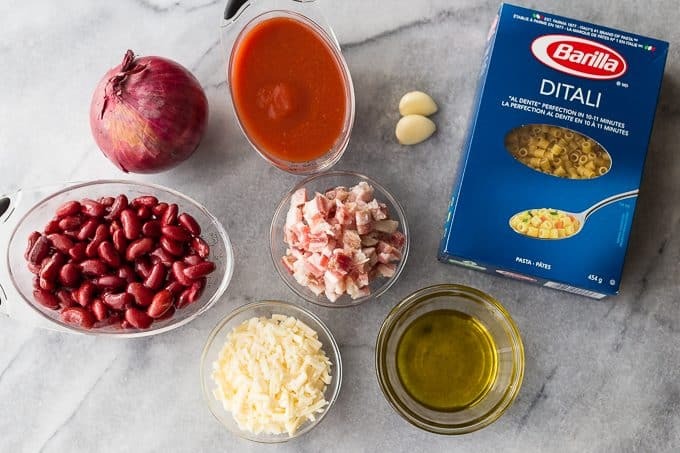 You’ll need your choice of Barilla Pasta (I used Ditali), olive oil, garlic, red onion, pancetta, kidney beans, tomato sauce and cheese. The Barilla recipe also suggested borlotti instead of kidney beans and Parmigiano cheese. I used Asiago cheese because our store was out of Parmigiano. You sprinkle the cheese at the end. The Barilla recipe had a few tips and terms that were new to me. Have you ever made a soffritto? You will in this recipe. It involves heating a pan with olive oil and gently sautéing the garlic, red onion and pancetta to flavour the olive oil. Another cool thing about this recipe is that it’s one pot. The pasta cooks right along with the beans and the rest of the ingredients. One of the benefits of using the same pot is that starches released from the pasta will make the recipe creamy. I also didn’t realize is that you are not supposed to serve it piping hot. Let it cool to room temperature first so that the flavours have a chance to mingle and settle in. It tasted amazing! It was hearty and filling. The pasta was perfectly cooked and the beans were creamy and practically melted in my mouth. This was my first time making Pasta e Fagioli (translates to Pasta with Beans) and I’ll definitely be making it again. Get together with your friends and family and enjoy a delicious pasta dish today! Maybe try this recipe? If you do, I’d love to hear how it turned out. You might also like this 5 Soup Pasta or Tortellini Casserole. Hearty and filling! This creamy pasta with beans will practically melt in your mouth. Add olive oil to a large pan on medium heat. Stir in garlic, red onion and pancetta and cook for about 5 minutes, until onion is softened. Stir in kidney beans and tomato sauce and season with salt and pepper. Cook for another 2 to 3 minutes. Add pasta and water to the pot and stir. Bring it to a boil. Reduce heat to medium and simmer an additional 10 to 12 minutes, stirring frequently. Add more water if you find it’s evaporating too quickly. Remove from heat and stir in Asiago cheese. Let it sit to cool down. When ready to serve, top with more Asiago cheese and parsley, if desired. 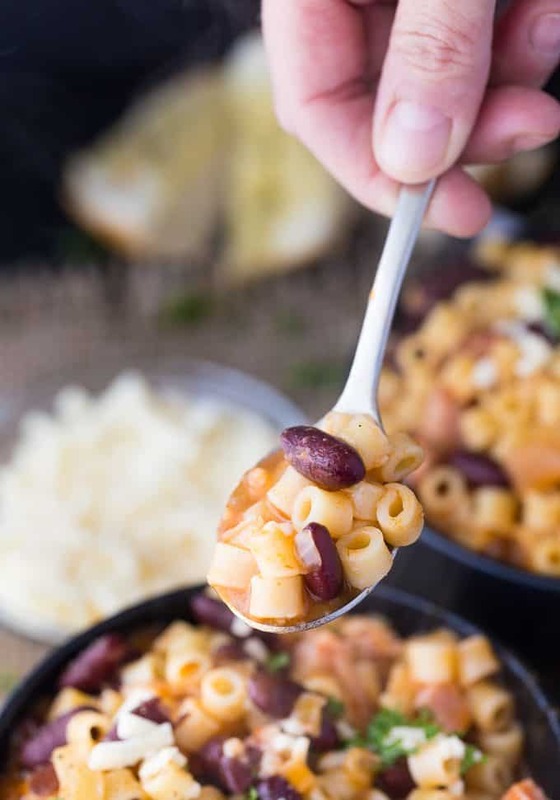 (Pasta e Fagioli) I have used Barilla pasta for many years now. I have made everything from lasagna to my homemade spaghetti with this product too. This is one recipe that I am going to keep in my recipe box for further making. This recipe looks delicious. I love Barilla products. Now I am hungry. That looks so tasty! 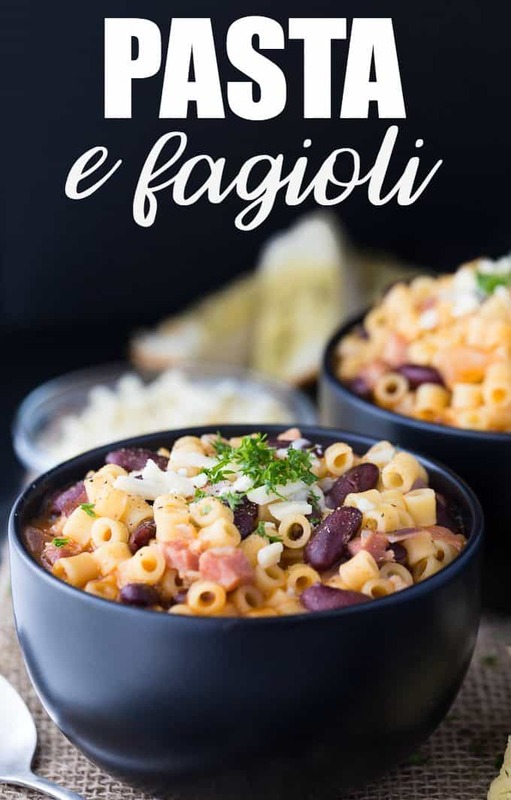 I have heard of Pasta e Fagioli, but I have never made it before. It looks delicious and easy to make. I want to make it real soon! 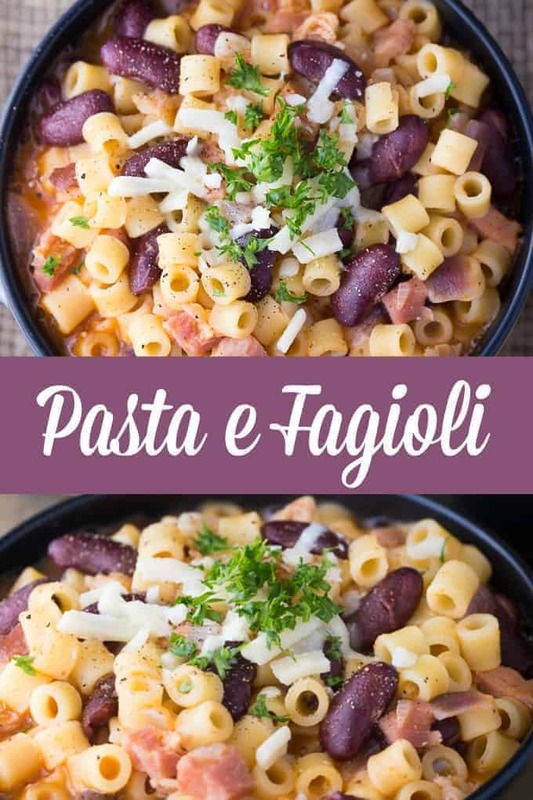 I love Pasta e Fagioli, it is such an easy soup to make and comes together quickly. I also add diced carrots to mine for a little extra flavor, but as a vegan I would leave out the pancetta. 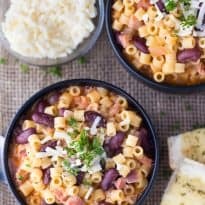 I also use one can of red kidney beans and one can of white beans to give it some extra flavor too. And this is definitely a soup where you want small pasta. I’ve just recently started making pasta dishes. I have an italian neighbor who is 85 and is teaching me how to make my own sauce. I think it would be amazing with your pasta recipes. This looks like a yummy new dish to try for my family! sounds perfect to make for cold fall nights! This looks so delicious and great for the cold nights. Yummy!! Great recipe! Pinning for later! What a great bowl of Pasta and so colorful! Hope you have a great week and thanks so much for sharing with Full Plate Thursday.